An exhibition of 652 artworks from 109 countries including paintings, sculpture, ceramics, video and installations. I have had a large painting selected for this prestigious Biennale. The theme was ‘the Silk Road and World’s Civilisations’ and initially we had to submit a PowerPoint presentation with an outline of the proposed work. My watercolour sketch was accepted and I painted my Silk Road interpretation on canvas with acrylic and spray paint. 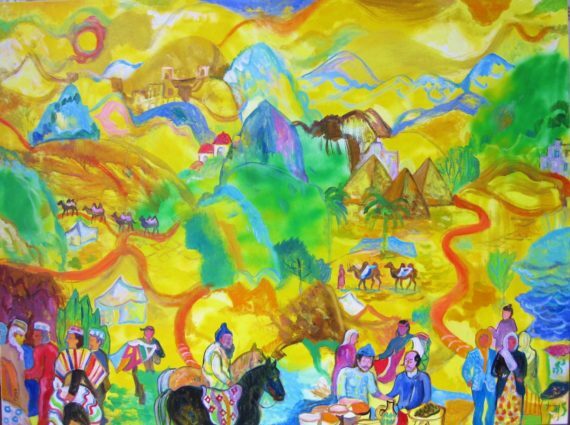 It is called ‘The Silk Road and Human Exchange.’ I imagined my canvas to be a piece of yellow silk with various activities delineated across it and references to ancient buildings. I wanted the sky to be like yellow silk blowing in the wind to represent the movement of ideas from one country to another. I am one of three artists representing the UK. I have been invited to Beijing for the Opening Ceremony on the 24th September and the Symposium on 25th September. My painting is 120 x 160 cm.